The galaxy of New Eden, the cluster of star systems that makes up the playable world of EVE Online, is divided roughly into three portions, Null security, Low Security, and High Security space. These designations are based on the relative safety of those areas, and how the game’s NPC police reacts to player actions. Null security space is a lawless land where players make the rules and run the show—that’s where a lot of the EVE incidents that make the news come from. Low security space offers players some limited protection if they stay near the NPC controlled Stargates and Space Stations, as powerful and invulnerable guns will fire on anyone who aggresses an unauthorized target. Finally, there is High Security space, or Hisec, where the NPC Police force, CONCORD reigns supreme. If any pilot commits a violation of CONCORD’s rules, such as firing upon a player who is not formally in a war or known as a criminal, then CONCORD battleships, which are immune to damage, will destroy the offender. CONCORD’s retribution is swift and absolute. Evading their punishment is actually a bannable offense in the game. CONCORD makes High security space safe. Every item in EVE Online, with very few exceptions, is built entirely by the players. There is chain of custody for each individual item starting from raw materials and ending in spaceship hulls, weapons platforms, or combat boosting consumables. Because of this, every single in-game item must be physically moved from place to place by a player, there is no teleporting of assets from one place to another. This has led to the establishment of major market hubs inside the game, where everyone goes to buy and sell their goods. The largest of these hubs is Jita, which has more total volume than the next 50 major trade hubs combined. Jita keeps its dominance because people know that everything can be found in one spot, for a reasonable price. This causes a need to ship a massive amount of goods into and out of Jita every day, because the game cannot support everyone simply living in the same spot. Enormous space freighters, piloted by people with an entrepreneurial spirit traverse the trade lanes between Jita and other smaller hubs, hauling Courier contracts set up by other players to help keep the up with the massive daily imports and exports from the Jita system. Freighters have no guns, and no way of actively defending themselves, but they have a large buffer of total hitpoints, and can generally rely on CONCORD to arrive in time to save them from the errant pirate that would dare attack them, since the vast majority confine themselves to the safety of Hisec. The only problem with that Hisec is not actually as safe as you would think. The Ministry of Love, or Miniluv, was born from the Goonswarm Federation, the largest alliance inside of The Imperium several years ago. Their goal: causing as much havoc inside of Hisec for fun, and for profit. The members of this organization dub themselves Ministers and do their best to spread the word of their gospel to anyone who will listen to it. The main point of their chosen cause, is that Freighters must die. To do this, they assemble the cheapest ships they can, except they are built to do as much damage as possible before CONCORD shows up on the scene to dole out justice. Their weapon of choice is the Destroyer class vessel, which is obtainable within an hour of first stepping into the game world. Small and maneuverable, a single Destroyer is nothing more than a mosquito to any freighter. However, during Burn Jita, Destroyers are not alone, as the entirety of the Imperium’s member base (somewhere north of 30,000 pilots) is invited to Hisec so they can participate in a full weekend of suicide ganking. 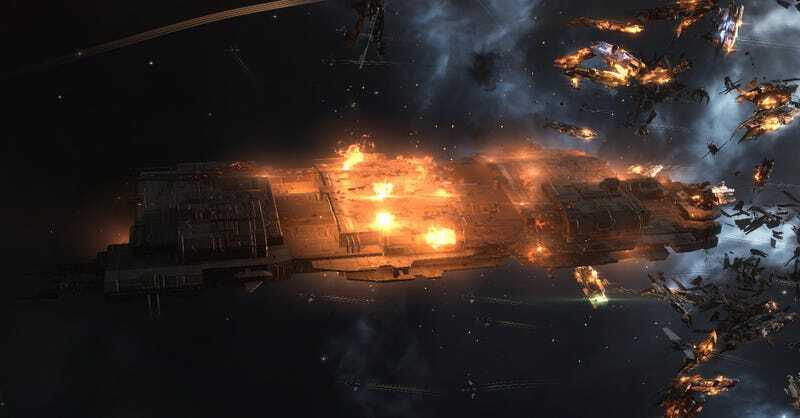 This years Burn Jita, which took place over the last weekend, had two full fleets of 250 players running in parallel to destroy any target that they could find. With the sheer mass of firepower that 250 players can bring to bear on a single target, the freighters stand little to no chance of survival, often dying before the entirety of the fleet manages to fire a shot, and forcing those with poor PCs or slow reaction times to have to shamefully fly their ship back to their home station, rather than suffer the wrath of CONCORD and get a free trip home. As of writing this article, the current Burn Jita campaign has destroyed 159 freighters, 22 miscellaneous large industrial haulers, and 19 Jump Freighters (which are highly expensive ships that can warp themselves deep into the dangerous areas with ease.) The butcher’s bill so far is up to 700 billion ISK in damages, roughly converted to real world value, that is around $13,000 USD worth of damage. All of this damage and destruction is focused on other players of EVE, so every time one of these ships goes down, a player somewhere in the world is losing a significant amount of the work they’ve put into the game. Though, the Ministry itself is not without losses during this event, according to internal projections, they have lost well over 20,000 Coercer Class destroyers in the past 72 hours, totalling to somewhere between 4 and 6 billion ISK worth of losses. They believe it is well worth the cost. I had a chance to sit down with the current leader of Miniluv, a player who goes by BoneyTooth Thompkins ISK-Chip, but others might call a digital terrorist within EVE Online. Lee: This is the 5th iteration of the Burn Jita event, how did it all get started? Lee: How many ships does an event like this require? How long did it take to prepare them? Boney: Burn Jita 3, in 2014, was my first Burn Jita. At the time, I wasn’t in leadership, but if I had to guess, we assembled around 18k ships. I built and assembled 6k personally myself. On Saturday evening, we ran out of ships and had to scrounge for hulls and fittings to keep the party going. This Burn Jita, we did significantly more planning and put forth significantly more effort. When I brought up Burn Jita at the January 28th Illum [Illum is a collection of The Imperium’s leadership] meeting, Mittani asked me what the earliest date we could Burn Jita was. I said the 24th to account for Warr Akini’s availability. So, that gave us just under 4 weeks to do everything we needed to do: produce ships, source guns, produce what fittings we could, get citadels [Citadels are massive player built space stations] set up, form alt corps to hold the ships, get posts up telling people what to do, and figure out what gimmicks we were going to do. Lee: What’s the most interesting thing about Burn Jita from your perspective, that most may not get to see? Boney: In general, the amount of thought, heart, effort and planning that goes into this event. It’s a logistical nightmare that requires a team of people to sort out and get their ducks in a row. Literally every weeknight and some weekend nights for the last two weeks have been spent preparing for Burn Jita in one way or another. More specifically? There’s been a lot of meta-gaming, rusing, spying, dissemination of false information this time around. It’s been absolutely incredible to watch Reddit, our enemies, our allies struggle with all the propaganda and disinformation that we have been spinning. As of today, the day before it all kicks off, I think people are finally catching on that it’s tomorrow, but there’s no certainty to it, and there’s no real proof, just people wanting, hoping, wishing. Even more specifically? Watching my awesome crew of dudes all selflessly volunteer to do most boring administrative tasks in EVE Online all for the sake of an all-weekend bender that we give to our alliance so ‘John Q. Goonlord’ can go to Jita and shoot some freighters. I love seeing the excitement in Imperium line member’s digital eyes when they talk about and get hyped for Burn Jita. I get PMs from random people telling me how excited they are, how it’s their first Burn Jita and they can’t wait, how they want to help out. I think that’s really my favorite part, seeing how much fun people can get out of all this effort me and my guys put in. Lee: For some perspective, what do you do in real life, and do your colleagues know about your criminal activities on EVE Online? Boney: I used to be a college lecturer while I was in graduate school. A few of my coworkers knew that I was a space important internet director leading the online space equivalent of a what could be called a terrorist group. It was a fun dichotomy between real life and internet life, oscillating between being an incredible selfless educator towards my students and colleagues and an online guerrilla where I grind the internet spaceship hopes and dreams of of the highsec pilots of the game into finely ground mush. These days I’m a software engineer. Some of my new coworkers know, but I don’t think they ‘get it.’ At least, not until I show them this article. Burn Jita is coming to a close in the wee hours of the morning on Monday. It has been going strong since roughly six am CST on Friday morning, and only taken breaks when the EVE game servers simply could not bear the load of so many pilots taking action in such a small area. I expect the fleets to continue to run through the game’s planned daily downtime tomorrow morning around five am, and then after some rest and recuperation, if there are any ships left in the Ministry’s stockpiles, they’ll return to normal operations. For them, Hisec is the endgame of EVE Online, and suicide ganking freighters is a way of life. Lee Yancy has been an avid gamer for as long as he can remember, but ever since discovering them, he has found himself almost completely absorbed him MMO style games. EVE Online and World of Warcraft dominate the majority of his time.